Espai d'Art Pere Pruna at MDM houses a small retrospective exhibition with various sculptures by Josep Maria Subirachs, offering a representative sample of his different artistic periods. 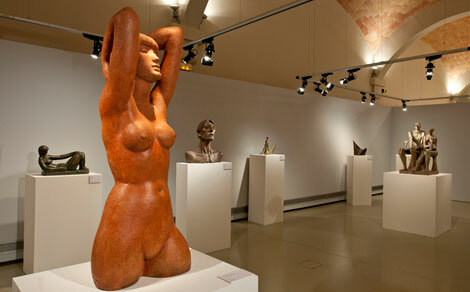 The Barcelonian artist, who passed away last April 7th, has been one of the most emblematic Catalan sculptors. He has led a solid, world-renowned career. The show –open until autumn- contains a small group of feminine figures that still give off the ‘Noucentisme’ movement’s influences of the forties and fifties, which would soon end up with a stronger expressionism. He then moves into a determined abstraction, and copes with tensions involving stamps and shims; an obsession for geometry built in a metaphysical conception of reality; the fascination towards the classical world, its mythology and its refined shapes… They make up a new repertoire that includes figuration again, as well as the game of volumes, fit in syntax full of cultured quotations, sometimes inscrutable. The exhibition –Subirachs sculptor, selected work- has counted on the collaboration of Judit Subirachs-Burgaya, daughter of the artist. Subirachs’ works are quite present in Montserrat. During his life, he made several works for the Benedictine monastery. The first one was Saint Michael’s Cross (1962), followed by the effigy of Saint Dominic de Guzman (1970); the monument to Ramon Llull (1976), the Chapel of the Holy Sacrament in Santa Maria’s Basilica (1977); Saint George’s statue (1986) and the image of Our Lady of Montserrat (2001), displayed at the Nigra Sum section of Montserrat’s Museum. In 2013 Montserrat welcomed two reliefs from 1985 –Ariadne and Hermes-, placed at the foot of the Monastery’s abbot’s tower, which belong to Subirachs’s most characteristic thematic universe. By means of these, the artist explains his own conception of manhood.